Looking for some amazing and engaging online casino games? Well, Royal Panda has got your back! Royal Panda is one of the best online casinos in India. As the name suggests, this online casino portal provides an ultimate royal experience. The Royal Panda welcomes you with a 100% deposit bonus of up to ₹ 10,000 along with several other cool features. Let’s not forget that this online casino has various popular games like roulette, blackjack, and baccarat in its arsenal. 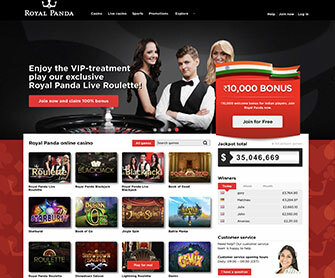 In this article, we will have a closer look at every aspect of Royal Panda Casino. We will begin with the bonus and promotion that the casino provides and would dig into more specific topics like the experience and support provided by Royal Panda in the later parts of this article. Needless to say, when you are an online gambler, what you are concerned about most is the ease to deposit and withdraw money. Thankfully, Royal Panda relieves you of all such worries and provides a range of methods through which you can deposit and withdraw money on the go. As a matter of fact, it is comparatively easier to deposit money through a range of channels including Neteller, AstroPay, MasterCards credit and debit cards, VISA credit and debit cards and ecoPayz. Likewise, when it comes to withdrawing money, you can make use of Skrill, Neteller, EcoPayz and AstroPay card. Generally, all the transactions are completed within 1 to 5 days, and there is no fee imposed by the Royal Panda. This is great when compared to other casinos which take a long time to process the money. What’s more? You can start playing by depositing as little amount as ₹ 1,000. However, if you want to withdraw the money, the minimum withdrawal amount is ₹ 750 in case of Skrill and Neteller, and ₹ 800 in case of AstroPay and EcoPayz. Further, when it comes to bank transfer, the minimum withdraw amount is ₹ 8,000. One of the best things about Royal Panda is the security that it provides. Speaking technically, everything is hosted on a secure and certified server. Further, additional safety measures have been adopted and all the data including the traction related information is sent to an encrypted server. It is important to mention here that the portal is Extended Validation (EV) SSL certified by Comodo which is enough to conclude that this online casino gaming portal is completely secure. The site is licensed by the Malta Gaming Authority and UK Gambling Commission which makes it legally safe to play and deposit money. What’s more? All the casino games available at Royal Panda are powered by advanced RNG (random number generator) software. Thus, stay assured, the website promotes fair play which is an important aspect and boosts the confidence of every player that everything is transparent. Further, regular updates are being made to rule out any odd chances. One important aspect of Royal Panda is that it allows you to resume your play from where you left it. In other words, if you are playing a blackjack and if you get disconnected in the midway somehow, then you need not worry! This is because Royal Panda would let you start the game from where you stopped when you play it the next time. In short, you can start off from where you stopped. This is true even for live games where you can login again when your connectivity is restored and check the result. Like most other online casinos, Royal Panda is quite generous when it comes to providing bonus and promotions. To begin with, once you have signed up successfully, and have made an initial deposit, you are greeted by a 100% match bonus of up to ₹ 10,000. You might argue that the welcome bonus is smaller than what other sites are offering, but believe us, this bonus is enough to keep the game going! In addition to providing the welcome bonus, Royal Panda also rewards its players by various other offers. A weekly Bamboo Bonus is one of these. Further, if you are a blackjack fan, you can also take part in Lucky 21 promotion which is held on 21st of every month. That’s not just about it. Royal Panda values your loyalty, and so, as you sign up, you are automatically enrolled in a free Loyal Panda program which means you get to earn points every time you play! When it comes to entertaining gamblers with an array of games and machines, Royal Panda masters the art. That said, it has something for everyone. One of the best and most common Royal Panda casino games include the progressive jackpot games. Additionally, you can also choose to play classic and video slots like Mega Fortune, Ghost Pirates, Hall of Gods and others. Further, table games like Roulette Pro by NetEnt, American Roulette by NetEnt and European Roulette are a big hit as well. If you are an ardent fan of live games, Royal Panda would not disappoint you at all. If you are more interested in playing light games, you can choose to go for video poker, scratch cards, and soft games. What’s more? You can also indulge yourself in sports betting in addition to playing casino! Perhaps we have some cricket fans reading if so then you can be sure that you can place bets on everything cricket at RoyalPanda with great odds from what we ourselves have seen. What’s more? You can also indulge yourself in sports betting in addition to playing casino! Royal Panda provides a world-class user experience, all thanks to the super-friendly website UI and ease of use. It is pretty simple to start playing at Royal Panda. All you need to do is sign up by providing all the required details – like your name, address, phone number, age and the like. As a matter of fact, you should be at least 18 years of age to be able to play online casinos legally. Once you have registered and made the initial deposit, you are greeted back with a welcome bonus. Now, all you need to do is play and keep winning. In Royal Panda terminology, scores are commonly known as Loyal Panda Points or LP points. These points can be used to redeem amazing gifts like a gorgeous piece of jewelry and latest phones. Login to your account click on “my account” option which is located in the top right corner. Later, select the gift of your choice and click add to shopping cart. Lastly, view your cart and confirm the purchase you have ordered. Talking about the mobile experience, Royal Panda also allows you to play games on your mobile phone. In fact, you can play roulette, blackjack and other 200+ games on your smartphones and tablet through their mobile app on the go! When it comes to providing a world-class customer support service, Royal Panda is not far behind. You can easily communicate with the customer support executives at Royal Panda either through chat, phone or email. Additionally, they have a comprehensive FAQ section which should be able to solve your issues. For any query beyond the topics covered by FAQ, you can drop them an email at [email protected], or alternatively, you can also fill up their contact form available on the help page. You can chat with them daily from 09.00 hours to 00.30 hours CEST. You can also call them at +356 2778 0418, or fill up a form to request a call back! All in all, it is safer to conclude that Royal Panda is one of the best online casinos in India. It is secure. It is robust and transparent. Further, it is properly licensed and holds reputable certificates from various authorities. Further, it has an array of amazing games, and provide a range of options through which you can make deposits and withdraw money. What more can one expect?